The kiosk extends the house on the outside, from lunch to dinner you can take all your meals. The linen and towels provided. Dinner tray the evening of your arrival at the price of 18 €. 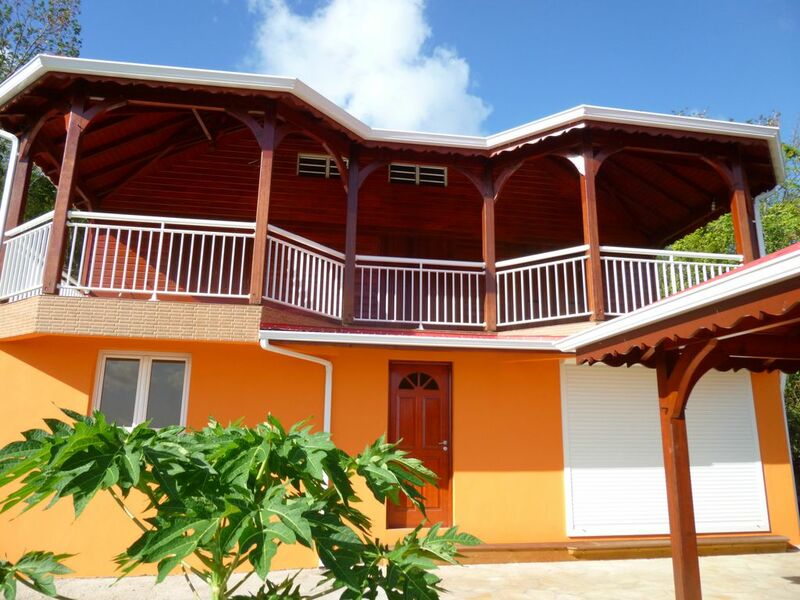 We had a great first holiday in the Caribbean staying at this villa in Pointe Noire. The house is lovely and everything works. It has a great outside seating area for relaxing and bbqs. If you want a quiet holiday, this is the place. The villa is right next to a great beach, perfect for swimming and looking at sea life. There are restaurants on the beach open for lunch, which are good. The hosts are wonderful as well. We got along fine in English, basic French and where necessary, google translate. We can sincerely recommend it as a base for a lovely holiday. Very nice house, spacious and clean. This house is spacious and clean. The kitchen is super, very well equiped. Guylaine, the owner and her daughter Elodie were very hospitable and very kind. Guylaine made several local dishes and drinks for us which we enjoyed. We stayed at this property for a week around christmas and had great communication with owners Guylaine and Nestor. They welcomed us with a great welcome package (alcoholic and non-alcoholic local fresh beverages, some butter, some coffee etc.) and despite the fact that our French is not great we managed to have some decent communication with Guylaine who came and checked up on how we were doing and if everything was ok regularly. Also the kitchen was well equiped and we managed to cook our own Christmas diner very successfully. The only thing we could complain about is that as it was rainy season that the musquitos couldn't leave us alone but that is no reason to not leave 5 stars. The proximity to Plague Caraibes (and Ile Pigeon) is also great for the folks that do not like to drive far and often. We recommend this property to anyone that loves to spend some time on this beautiful island and loves to do some self catering. Nach unseren Erfahrungen mit Ferienwohnungen war die Überraschung groß, als wir Guylaines Appartement betraten: sehr (!!) sauber, ausgestattet mit Möbeln und Dekor, die Geschmack verraten und nicht irgendwie zusammengestellt wurden. Die Küche - wir haben sie allerdings nur zur Bereitung des Frühstücks benutzt - ist umfassend ausgestattet, der Geschirrschrank enthält alle notwendigen Utensilien. Die Herzlichkeit von Guylaine und Elodie bringt zum Ausdruck, wie sehr ihnen das Wohl ihrer Gäste am Herzen liegt. Wir haben uns bei ihnen sehr wohl gefühlt und würden jederzeit wieder kommen, wenn nur die Reise nicht so lang wäre. Seht die Bilder an, sie sind eine gute Darstellung des Angebots. Au plaisir de vous revoir en Guadeloupe. Un grand merci à Guylaine et Elodie pour leur accueil et une mention spéciale pour les punchs et gourmandises offerts. Une excellente adresse que nous gardons précieusement pour un éventuel futur séjour en Guadeloupe. Toutes charges compris Le tarif indiqué est pour 4 personnes Vous pouvez louer le logement pour 2 personnes Le logement doit être rendu dans l'état de propreté dans lequel vous l'avez trouvé. Le forfait de ménage est au prix de 45 €.